What did Anne write about? Read the story of Miep Gies, who hid the Frank family, and an interview with Anne's friend, Hanneli (Lies) Goslar. The following organizations work to educate young people to reject prejudice and injustice, in memory of Anne Frank. Includes photos and information about Anne and her family. 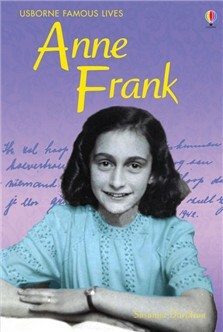 Thoughtful account of the extraordinary life of Anne Frank for young readers. Lively narrative text, colourful illustrations and photographs bring the subject alive. Includes essential facts and insightful details to help the reader understand the famous person and their times. Internet links to recommended websites to find out more about Anne Frank's life and times. Part of Young Reading Series 3 for fully confident readers. The narrative style of this book makes it easy and enjoyable to read, quickly drawing children into the account of Anne's life... This account of the courageous young girl will hopefully encourage children to read her diary. The narrative style helps bring the awful story alive and is a super stepping stone to encourage young readers to pick up the diary that Anne painstakingly wrote while she was in hiding... written in a way that reflects the nightmare that Frank and hundreds of thousands of people lived but is finely tuned for a young audience. This is a great book, but very sad. I recommend it to any young reader if you're interested (I love the story, I know it back to front). It is a great remembrance of the holocaust and the people and the Jews who suffered it. I cried at the end of this book. I thought that this book was very sad and when you turned a page you always want to read on. If I had the chance to meet her or anyone to do with this or the author I would be amazed. This book is amazing. I enjoyed reading this book. It took me a day to read it, it was just great. But it was sad when Anne died. Anne Frank is a wonderful book! "Anne Frank" gives helpful information on her and the holocaust. "Anne Frank" and "Anne Frank: the diary of a young girl" are a couple of my favorite books on anne frank. thanks, Usborne, for making such dramatic books for young readers like myself.